I need a good and clear blueprint or construction-drawing (like the one on the right) for example in A3-format. Photos help me to see details, material and colour. 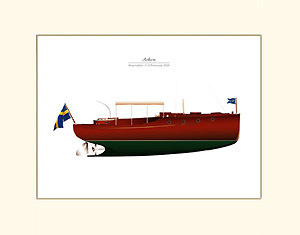 The price include 1 original illustration, 2 copies mounted in acid-free, off-white passepartout + 1 jpg-picture you could use for your website. For more details - Please, contact me. I really like the idea of illustrating some classic US-racers/runabouts (like GarWood or Cris-Craft) - If You are in possesion of good blueprints/drawings - Please contact me. I'll give you a special price for my first US illustration! 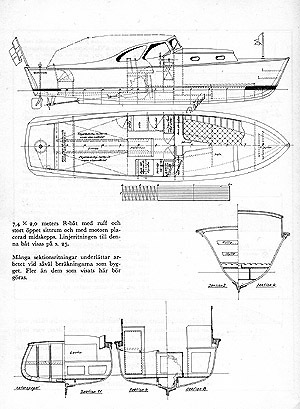 If you have a Swedish boat, but don't have any constructiondrawings or blueprints- I might be able to help You. Please contact me for more information. All illustrations, as seen in the catalog, are in stock. The illustrations are copies of original artwork, printed on highclass, glossy 220gr paper and mounted in acidfree offwhite passepartout 30 x 40 cm, ready to frame. The pictures are protected with a plastic cover and ships in a A3 cartonreinforced envelope. Posters are packed in a heavy paper-roll. Please e-mail me for current postage fee. As soon as I receive the payment, I will send the illustrations. Want to be a Classics Illustrated dealer?